“Bread lacks, the cholera deadlier grows / From the Lagoon Bridge, the white banner blows”. These immortal words, from the famous poem The White Flag on the Lagoon Bridge at Venice by the patriot and scholar Arnaldo Fusinato, attach a rhyming scheme to the story of the epic defence of the lagoon city by forces led by Daniele Manin. Almost a year after the Republic of San Marco declared independence, they were forced to surrender to the Austrian forces. This incident was one of the most significant in the uprisings of 1848, which swept through cities across Italy and Europe more widely, including some which were already important hubs for Generali at the time: Venice, Milan, Florence, and Naples on one side, and Vienna, Budapest and Prague on the other. The birth of the Republic of San Marco under Manin’s leadership was endorsed by several prominent figures within Generali, including Leone Pincherle (Secretary) and Isacco Pesaro Maurogonato (who would go on to become an advisor to the board and, later, its director), who openly sided with the revolutionaries, taking up prominent roles in the nascent government. After Venice surrendered in 1849, they were sent into exile. In February 1850, Pincherle was succeeded as Secretary to the Veneto Head Office by Daniele Francesconi. A native of the March of Treviso (Cordignano 1810 – Venice 1875), Francesconi had already spent over a decade in the Generali family as an agent in the Ceneda office, near Vittorio Veneto, where he had found employment in his chosen profession as a civil engineer after graduating from the University of Padua. As an active member of the Republic of San Marco, he distinguished himself with his command of the Treviso legion in its defence of the fortress of Marghera. After Venice fell, Francesconi fled to Switzerland, returning to his homeland only after the Austrian authorities granted an amnesty. As Secretary, he was responsible for expanding Generali’s presence throughout the peninsula. Following the uprisings, Trieste’s economic expansion picked up pace once more. Its port was the primary access point to the sea for the Austro-Hungarian Empire, and the second in southern Europe after Marseilles. This was partly due to the Südbahn, the train line connecting it to Vienna. Generali also benefitted from the positive economic climate following the setbacks of 1848. Inspired by Francesconi’s intuition and foresight, the company diversified by expanding into real estate investment. 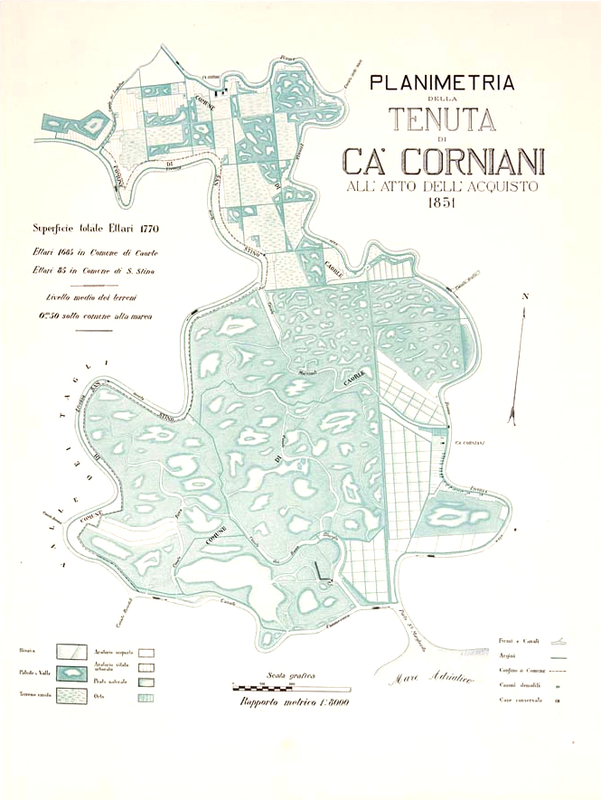 In 1851, the company purchased a vast area of marshland in Veneto between the Livenza river and Caorle: an extensive land reclamation project gave birth to Ca’ Corniani, a business which remains a vital part of Genagricola’s entrepreneurial outlook today. It has not been possible to establish the exact nature of Francesconi’s political activities in the decade following his return to Venice. It is known that he was arrested in June 1859 following street riots. 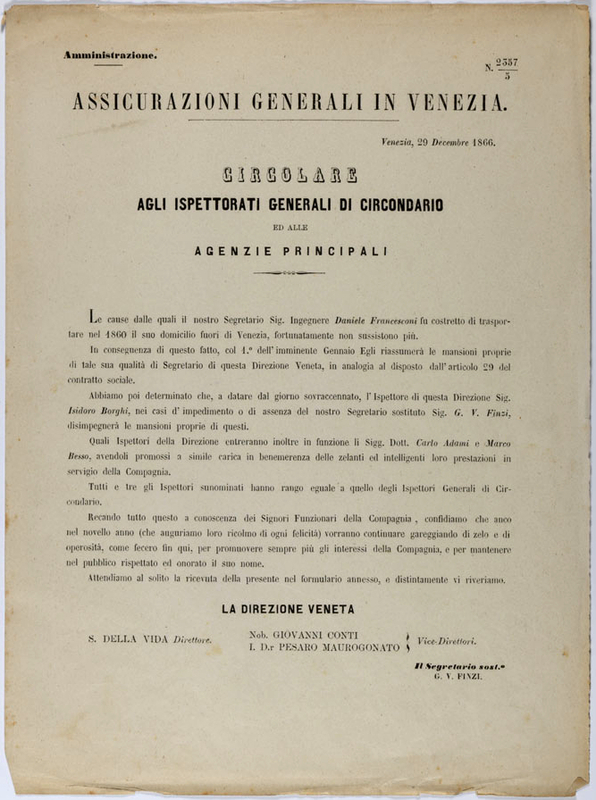 He was released from prison in the wake of the permanent treaty signed after the Armistice of Villafranca; however, a decree saw him banned from returning to Venice until the end of the Third Italian War of Independence in 1866, which led to the annexation of Veneto to Italy. He continued to serve as secretary to the Veneto Office throughout his confinement, first from Turin and then from Milan, such was the trust placed in his exceptional technical and organisational skills by the Trieste Management. Indeed, during his first stay in Turin in 1860, he sent a wide-ranging and detailed project entitled “Current management structure of the Assicurazioni Generali Company in Italy and plan for a new system”, focussing on entrusting the Veneto Office with direct administration of all affairs at national level. 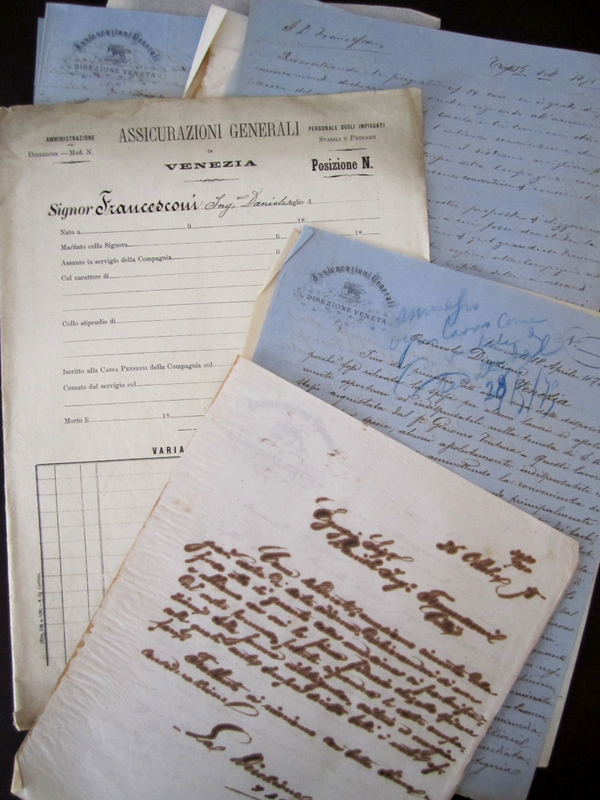 This document contained over 200 handwritten pages which were submitted to the board in January 1861 (shortly before the declaration of the new Kingdom of Italy), and these can still be found in Generali’s archive today. “An agricultural engineer with an attachment to fire insurance, and a particular fascination with crop-hail insurance”, as one of his disciples, Marco Besso, described him, Francesconi is one of a group of Generali employees whose own story is inseparable from that of the company. For more information see: A. MILLO, Daniele Francesconi in Generali in History: Tales from the Archive. Nineteenth century, Venice, Marsilio, 2016, p. 178-183.